Before westerners flooded the market with plastic instruments nobody wanted, the Japanese owned the music game genre with hits like Dance Dance Revolution, Parappa the Rapper and Taiko Drum Master, inadvertently laying the foundation for Guitar Hero and Rock Band. Groove Coaster, from Taito, reminds us why we fell in love with Japan so many years ago. This wonderful iPhone and iPad game transports us to a wire frame universe pulsing with beats so divine you'd be foolish to play without wearing headphones. The game works for a variety of reasons, mostly because it's easy to grasp. You can think of it as a roller coaster of sorts. Your avatar travels along a winding track full of targets. Whenever said avatar passes across one, you tap the screen to create music. It's a bit more complicated than that. At times, you must tap in rapid succession, flick in a certain direction and press and hold, but that's the gist of it. Then it's just a matter of selecting a difficulty to test your skills. From there, the more you succeed, the easier it'll be to unlock new avatars, tracks and other bonus items; Taito also sells virtual goods via in-app purchase. At the same time, you'll treat yourself to an excellent soundtrack comprised of rock, pop, hip-hop and techno. Bottom line, there's something for everyone. In addition, Groove Coaster has no shortage of visual eye candy. 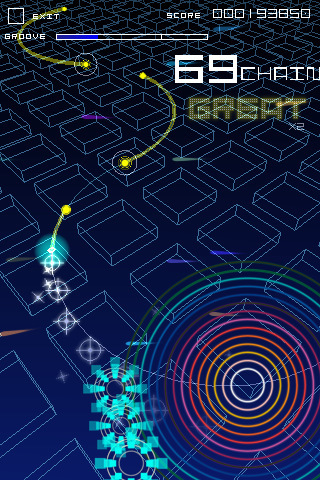 The game's a cross between Space Invaders Infinity Gene (also available on the App Store) and the console classic, Rez. Colors explode from all directions, patterns dance their way across the screen and that proverbial roller coaster track takes some unexpected and delightful turns. Even better, as you play, the game creates a personalized track that constantly evolves depending on your progress. On the downside, charging $0.99 for songs (each) is a bit steep, especially when they last a couple minutes, at most. What's more, we occasionally lose avatars in the chaos, and there's no landscape mode. Those issues notwithstanding, Groove Coaster's a wonderful fusion of stimulating graphics, music and touch based play, making it an essential download for iPhone and iPad users. Great job, Taito. What's Hot: Cool music, futuristic graphics, addictive touch based play, unlocking stuff, only costs $0.99 (limited time only), universal. What's Not: Paying $0.99 for additional songs, losing avatars amidst the chaos, too short, no landscape mode..